It's a strange feeling, receiving such a keenly anticipated phone to review. The hubbub of launch events, hands-on previews and heated debates suddenly dies away, leaving you with one small and intensely silent cardboard box. In this instance, the packaging contained the "marble white" version of the Galaxy S III (not the more daring "pebble blue") alongside one burning question: apart from all the hype, do this handset's paper credentials translate into a product that is worthy of serious cash and a 24-month commitment? Those credentials are certainly more subtle than those of other recent devices. There's no unusual camera, stand-out display or unibody build. Instead, we get an abstract design statement about the phone being "inspired by nature" alongside a list of incremental hardware improvements such as a quad-core processor, as well as fresh additions to Samsung's customized Android 4.0 skin. As it turns out, these specs forgo immediate swagger in favor of creating a solid workhorse of a smartphone that is intent on attracting a long-term following. Read on and you'll discover just how it pulls that off. The GS III is an all-rounder of a superphone, but strong competition on the Android scene will stop it reaching the heights of its predecessor. How would you rate the Galaxy S III? 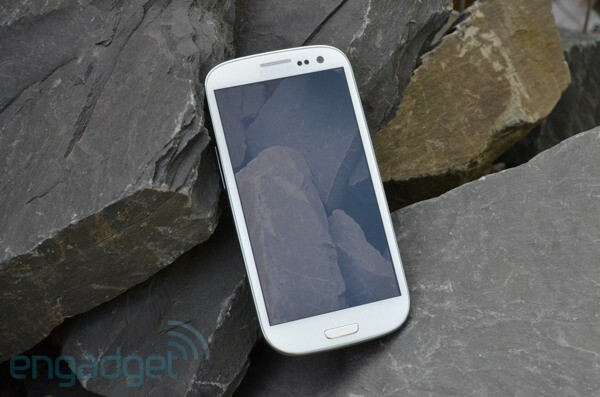 There's no point in skirting around the fact that the GS III can be deflating when you first look at it. That's partly because its rounded corners and glossy finish make the phone look more mainstream and less, well, edgy than the Galaxy S II, but also because the handset still bears so much physical affinity to its predecessors. The earpiece and speaker grilles, camera lenses, home button and other items of furniture are all in their familiar and predictable bolt-holes and there's nothing overwhelmingly new about any aspect of the design. HTC tried something different with the build of their new flagship, the One X, but on this occasion Samsung has voted conservative. In any case, once you get past that "oh, it's another Samsung" vibe, you realize that the GS III's design tradition is -- in many respects -- no bad thing. Minimal bulk with no frills is what Galaxy phones are all about, and seeing as this particular model lugs a 4.8-inch panel it's only right that Samsung's designers used all their old tricks to keep the weight and dimensions to a minimum. Thanks to the signature plastic build and paper-thin peel-off rear cover, the weight is kept to a respectable 135 grams (4.7 ounces) -- yes, that's still 17 grams more than the GS II, but it's way less than a unibody handset like the Lumia 900, which weighs 160 grams while possessing a smaller display. The GS III is also just 8.6mm (0.34 inches) thick, which is only marginally fatter than its predecessor and still well below the average smartphone belt buckle, despite the inclusion of a hefty 2,100mAh interchangeable battery. Speaking of interchangeable: in addition to the battery we also get a microSD slot, which means you won't have to pay over the odds for more storage. That adds up to a second (and increasingly rare) tick for the GS III -- from the current pack of rivals, only the HTC EVO 4G LTE matches this spec, but that's still a niche device due to its limited radio. Some buyers will still be put off by this handset's length and width, but at 136.6mm long and 70.6mm wide the GS III actually falls well inside the bell curve of other current big-screened flagships. It feels like a phone, not a phablet, and when you bear in mind what you get in return – a vast, amazing display, for example – the slightly XL dimensions feel like a bargain. Overall, the build quality is hard to criticize. The plastic is extremely well put together, it doesn't flex or creak and the phone never feels fragile. The all-over continuous sheet of Gorilla Glass 2 on the front panel did a good (though not perfect) job of fending off car keys, while the glossy rear cover was equally impervious in its own way. What more could you want from a phone that's going to follow you around for years on end? The GS III's display is a 4.8-inch window onto wondrousness and certainly a major selling point. It has all the contrast and deep blacks that we've come to love from AMOLED displays, but it's also bigger than average, with a healthy pixel density and -- most importantly -- much better color rendition than some older AMOLED screens. Six months of progress has led to real visual improvements since the Galaxy Nexus, even though the underlying screen technology is the same: colors aren't over-saturated and they don't have that unnatural blue-ish tint. 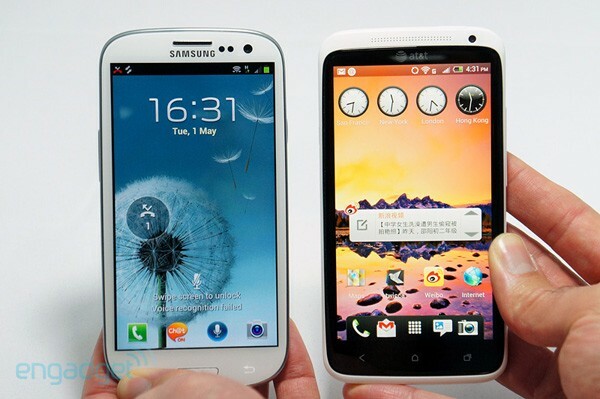 In fact, the color temperature is very similar to that of the HTC One X, which uses more conventional LCD technology, and that's a huge accomplishment for Samsung. Although it doesn't sound like much, the extra screen size is noticeable and great to have. 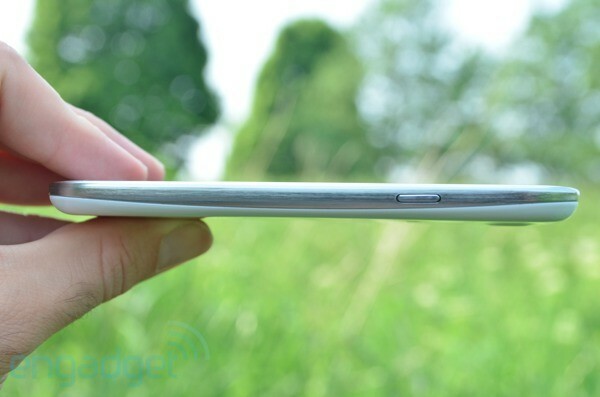 It's 0.1 inches bigger across the diagonal than the HTC One X, and 0.15 inches bigger than the Galaxy Nexus – which equates to a seven or eight percent difference in surface area. When it comes to watching videos, reading e-books or surfing websites, every fraction helps. In fact, if you almost made the leap to the jumbo Galaxy Note but couldn't quite convince yourself it was sensible, then the GS III could be the compromise you've been waiting for. The extra screen size helps to mitigate the effect of the PenTile technology that Samsung uses in its AMOLED phones. The extra screen size also serves another useful purpose: it helps to mitigate the effect of the strange PenTile technology that Samsung uses in its AMOLED smartphones these days. For the benefit of those who haven't followed this controversy, here's a refresher: PenTile displays generally don't deliver the pixelation-free appearance that you'd rightfully expect when you purchase a smartphone with a stated resolution of 1280 x 720 and a pixel density of 306ppi. 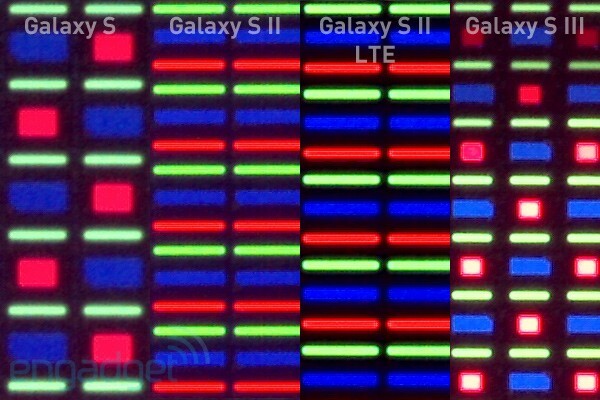 The photo above demonstrates why, by comparing the Galaxy S line of displays under a 230x microscopic zoom. Look how nice and neat the older GS II's red, green and blue sub-pixels are: they come in tightly-bunched trios (i.e., an RGB layout). The newer GS III, however, is meant to have three times the resolution of its predecessor, but if you count up its sub-pixels you'll see that it has nothing like that numerical advantage. Its sub-pixels are awkwardly spaced out in a PenTile matrix, just like the first Galaxy S. When you zoom back out to a normal viewing distance, that arrangement of sub-pixels generally results in grainier or fuzzier images. Should the world bang on Samsung's doors and demand a 300dpi letter of apology? Well, maybe, but not so much with the GS III, because it's largely rescued by its extra screen size. Having a 4.8-inch panel encourages you to hold the phone slightly further from your face, and even lengthening the distance from your eyeballs by a couple of inches can be enough to obscure the PenTile effect. Compared to the PenTile display on a Lumia 800 for example, which is both smaller and has a lower resolution, the GS III was infinitely nicer to look at, to the point where the word "PenTile" was totally forgotten after a couple of days of acclimatization. We'd only advise caution if you're an avid e-book consumer and you're extremely fussy about your text looking like it would on a printed page – in that case you may well prefer the HTC One X's Super LCD2 alternative. In the meantime, the world can save the door-banging for the GS IV. Raw speed. That's what the GS III brings to the photographic table, and it's one of the most practical benefits of its powerful quad-core engine. 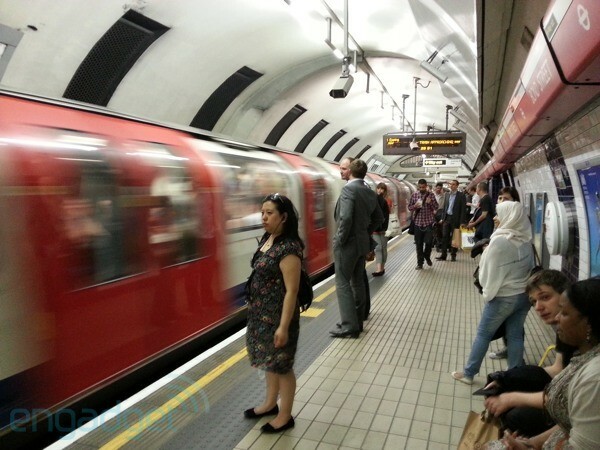 We pulled off six frames per second with full 8-megapixel resolution by holding down the shutter button while in burst mode, which was slightly more than the HTC One X and totally sufficient for getting a nice smile out of shy subjects. In Single Shot mode, there was virtually no shutter lag, which greatly assisted shots of moving targets: what you see when you tap the screen is exactly what will appear in your gallery afterwards. 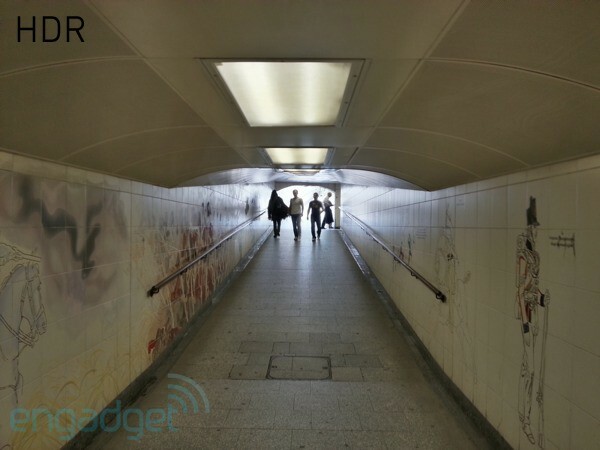 There is probably a slight delay, but it's so small that it's imperceptible – judging from a non-scientific test, it's less than 0.1 seconds and shorter than the lag on the HTC One X. Overall, the speed and ease-of-use of this camera can change the way you shoot pictures – not simply by filling up your microSD card with more photos than usual, but by encouraging you to push for ever more interesting shots that wouldn't possible on a regular laggy phone. 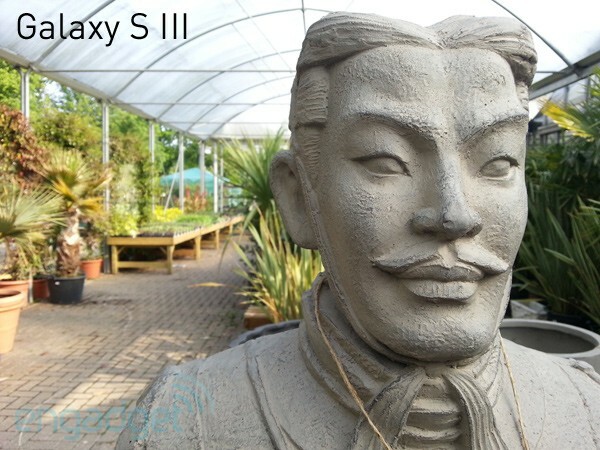 Of course, none of that would make sense without great image quality, and fortunately the GS III is up to scratch in that area too – even though it doesn't show a great deal of progress from earlier Galaxy phones. 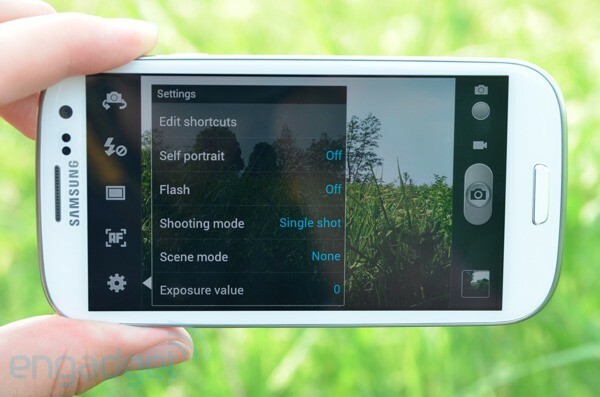 In many ways this is good: previous models delivered sharp and colorful images, while earlier iterations of the TouchWiz camera app also offered a high level of manual control, and those qualities have been carried over into the GS III. This includes the press-and-hold method of taking a photo, which allows you set focus and exposure before re-framing and releasing the shutter to take a shot -- a system that encourages more creative control and which is sorely lacking on the One X. It also includes the ability to set the compression level (Normal, Fine or Superfine). With the lowest compression, still photos generally weigh between 2.7MB and 4.7MB, which means they contain precisely the amount of information we'd want from such a high resolution image -- other phones are known to cap file-sizes at around 3MB, which hurts image quality. The GS III also brings a multi-exposure HDR mode for bringing out more detail in highlights and shadows, and that works well. There's also a panorama mode for stitching together multiple shots to great one long horizon. Just like HDR, this is mode is extremely fast thanks to the processor. It's quick and easy to pull off little creative tricks. The only thing missing here is real optical development: the maximum aperture is f/2.6, which is basically the same as its predecessors and well behind the light-loving f/2.0 lens on the HTC One X. 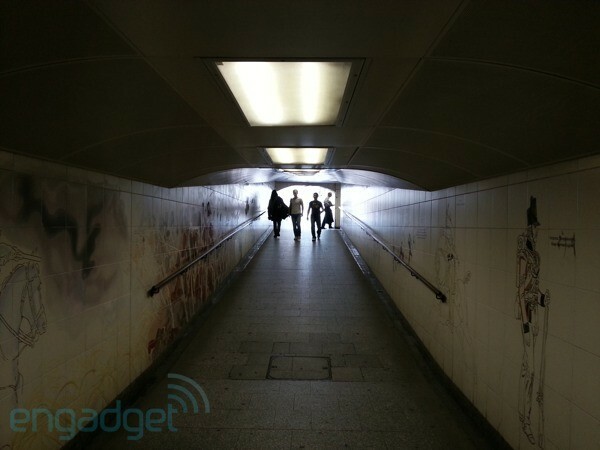 This means the GS III will generally be worse off in low-light situations, although we still found that it performed admirably, with minimal noise. 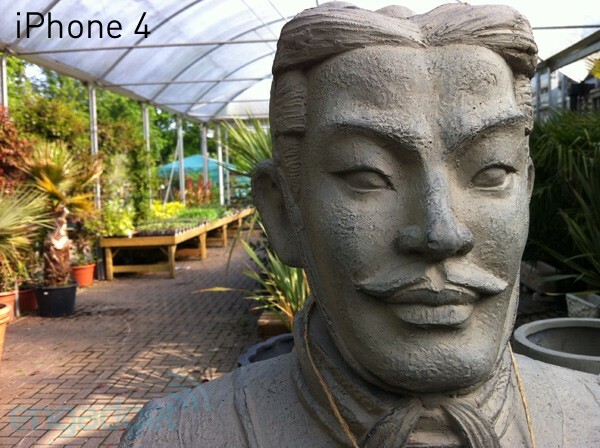 Also, compared to the excellent camera in the iPhone 4 (not 4S), the GS III may overexpose slightly and show less dynamic range -- its images are sharper and have more accurate colors, but at the expense of being less dramatic. Moving on to video footage and it's clear that once again the snappy processor is living up to its rep: autofocus during video recording was some of the best we've seen in any smartphone. 1080p is recorded with a data-rate of around 2.2MB/s, which is very healthy indeed, and autoexposure shifts smoothly and sensibly. There's no slow-mo unfortunately, which counts against the GS III because that would have been a cool feature to have, but regular 1080p / 30fps footage is smooth and largely free of the rolling shutter "jello" effect. So, we come to one of the GS III's not-so-secret weapons: its Exynos Quad processor, which is the only other engine beyond NVIDIA's Tegra 3 to bring more than two cores to a mainstream handset. If you need further evidence of just how bleeding-edge the new 1.4GHz quad-core Exynos is, you only need to look at its transistor size. Shrinking transistors is an expensive, painstaking business that only high-volume companies like Samsung can afford, but for the end user it broadly translates to a capacity for more performance with less battery drain -- yes, that's both at the same time; one of the physical world's rare win-win situations. The GS III's silicon is a fabricated with a 32-nanometer process, which is significantly smaller than last year's generation of 45nm phones and also smaller than Tegra 3's 40nm process. The only other mainstream mobile phone processors that benefit from such shrinkage are Intel's 32nm Medfield, which is put to good effect in the Lava Xolo for example, and Qualcomm's remarkable 28nm Snapdragon S4, which powers phones like the HTC One S and the LTE version of the HTC One X. Okay, so what is this highfalutin Exynos chip capable of in real-world terms? Let's start with daily operation first: this phone boots up from cold in under 25 seconds and never stalls, never lags and never trips over itself. Whether you're navigating picture-heavy PDFs in Polaris Office, playing back chunky 1080p clips shot on your DSLR, or simply surfing content-heavy websites, you'll never even think about the processor. The true power of this processor will only materialize as the software becomes available to exploit four-way multi-threading. In the meantime, the only way you're going to test this phone is if you get the chance to do crazy things like running tough augmented reality apps (something we'd like to do in future, in order to test the graphical component of the Exynos), or a dual OS, or playing Skyrim, or if you run benchmarks. On the whole you're looking at a device that is unsurpassed in terms of performance. On the whole you're looking at a device that is unsurpassed in terms of performance. The GS III loses out to the One X on a few scores but beats it on others. It does particularly well on the SunSpider score, which reflects web-browsing performance: it's on a par with the One X here, and well beyond the latest Apple A5-based devices –- for instance, the new iPad only scores 2,011ms. If we look at Tegra 3 devices, like the global version of HTC One X, which isn't listed on the table above, we see a similar picture of the GS III winning on some and losing on a couple (namely CF-Bench and Quadrant). Overall, we'd have to call it a draw between the GS III and either variant of the HTC One X, at least on the basis of these specific tests. Lastly, for the sake of comparison with a few older and cheaper devices, we've included above a legacy table with our previous suite of benchmarks. Although these benchmarks struggle to distinguish between the very latest phones -- which is precisely why we've moved on from them -– they nevertheless prove two things. Firstly, if processor grunt is a primary concern then you don't need to splash out on a GS III: you can do at least as well with a the Snapdragon S4-fueled HTC One S, which is a significantly cheaper handset. Secondly, the Galaxy Nexus – much as we love it -- is now very much last year's news in terms of horsepower. In our looped video battery run-down test, the phone lasted somewhere between 8.5 hours and 9.5 hours. This is a great result given the phone's screen size and resolution, and the fact that it only has a very early firmware version. It's also basically the same as the nine hours achieved by the AT&T HTC One X -- so close that we're going to re-run the test to get a more precise measurement and hopefully establish a clear winner. We'll update this review as soon as that's done, and also add more battery-life examples of everyday usage, but in the meantime, rest assured that this phone already scores extremely well for battery life. Update: a second run of the looped video test yielded nine hours and two minutes. That's a brilliant score given the screen's size and resolution. Motorola's Droid RAZR Maxx might offer up more, but that phone is only qHD and its processor is relatively underpowered compared to the GS III's. The GS III is an Android (Version 4) phone, but it has a very heavy TouchWiz skin stuck on top of it. This means that in addition to the typical Android-style clutter of widgets and menus and settings screens, the phone also has Samsung-only twists that add to a general sense of busyness. For fans of iOS (no widgets) or Windows Phone (no clutter), the whole thing might be a turn-off. Equally, if you're a devotee of the pure Android 4.0 user interface, which is more fluid and less busy than earlier versions, then you'll also be disappointed. It's understandable that Samsung wants to make its own mark on Android and differentiate itself from the competition, but did it really need to mess with Android 4.0 so brutally in the process? When you look at how much effort Google puts into improving its open source OS, it's actually unforgiveable for Samsung to come along and give us a skin that makes it all feel like old-fashioned Android 2.3. The phone doesn't even follow the latest button conventions: it has 'back' and 'menu' capacative buttons on either side of the physical home button, and thus omits the 'multi-tasking' button that came with the ICS. This means you have to press and hold the main home button for a second or so (honestly, it feels like an eternity), just to move between the apps that you're running. It's backwards and it's wrong. 50GB of free Dropbox storage. So good. This storage boost was triggered when we first signed into the pre-loaded Dropbox app, and it suddenly made it feasible to automatically stream our photos to the cloud. Happy days. Swiping contacts to call or message them. The simplest ideas are often the best. Swiping contacts left to send them a message or right to ring them became second nature after a while, because it's a lot faster than navigating sequential screens and tapping buttons. In fact, Samsung should have made even more use of swiping gestures, for example home screen and multi-tasking navigation like on the iPad -- the screen size is easily big enough to handle it. Smart stay. The screen refuses to timeout when you're looking at it, based on face recognition via the front-facing camera. There's nothing worse than a screen that switches off just as you're starting to make sense of the content it's showing you, and this feature nips that problem in the bud. Social tag. When you first take a photo of someone, the phone asks you to name them. From then on, it does all the hard work of recognizing that person again in future snaps, and linking up their social networking profiles so that you can share your photos faster. This should also make it really easy to catalog a gallery, or search it for pictures of a particular person, but we didn't spot a way to do that. Face unlock. 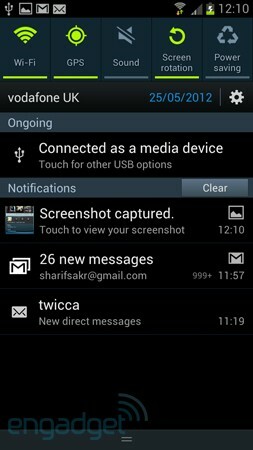 This is a stock feature from pure Android 4, but fortunately Samsung has carried it over to TouchWiz. It works great and it's the easily the fastest method of unlocking the phone, even though it isn't the most secure – it also disables the ability to jump straight into a specific app from the lock screen, which often undoes some of its speed gains. S Beam. This could have been so powerful, but it instead represents the problem with Samsung's philosophy. They've taken two open-source standards, Android Beam and WiFi Direct, and transformed them into a proprietary wireless interface that is extremely fast, but which only works between two GS III handsets. Aside from the ethical implications, how often are you going to get a chance to use this feature? S Voice. This isn't as "human" as iPhone's Siri. It doesn't work as quickly or as intelligently, and it often cuts you off mid-sentence, thereby wasting time interpreting meaningless fragments of requests. With patience it can yield better results, but overall it's hard to imagine many people using it on a regular basis. Do that many people even use Siri? The best thing about the Galaxy S III? That it's more than the sum of its parts. Individually, the slightly larger and better display, stronger processor and faster camera may not sound that special, but in daily operation they score major combo points: gathering up all the best bits of the older Galaxy S II and re-working them into a solidly modern (read: mid-2012) device. The power- and storage-hungry Android user simply cannot go wrong with this purchase, and neither can those looking for a great camera. The worst thing about the GS III? No matter how hard it tries, it just isn't greater than the sum of the HTC One X's parts. That's not to say it falls short, but merely to emphasize that times have changed since last year's Galaxy S II, which landed on an unsuspecting world that was largely devoid of predators. The Snapdragon variant of the One X has similar computing power, battery life and photographic credibility, but it also has a much better user interface that sticks more closely to the guiding ethos of Android 4.0. The One X also has a more forward-looking physical design, while the GS III clings to the tried and true styles of old. Perhaps the biggest sacrifice you'd make by going for the One X over the GS III is the loss of the cheap storage offered by the microSD card. That's a painful thing to give up, but given how deeply we feel about the need for Android to move forward and not get stuck in a Gingerbread-flavored groundhog day, we might just take the hit.